1 What Is Carpal Tunnel Syndrome? Symptoms of carpal tunnel are localized to the area of the wrist and hand, and include pain, discomfort, weakness, numbness, or tingling of the area. It is not uncommon for these symptoms of pain, discomfort, and weakness to also radiate up the arm from the wrist. Though the exact cause is not known, symptoms of carpal tunnel pain may be related to irritation of the nerve that extends from the palm of the hand up the forearm. This nerve is known as the median nerve, and it is responsible for the transmission of information between the brain and the fingers of the hand. More specifically, this nerve is responsible for relaying sensory feedback from the palm-side of the thumb and three of the fingers (not including the little finger), as well as providing motor control for the small muscles in the fingers and thumb. At the base of the hand, near the wrist, there is a channel that feeds the median nerve into the hand from the arm, known as the carpal tunnel. This structure is comprised of bone and supportive ligaments to create a protective passageway for the nerve bundle at the wrist joint. While the bone and supportive ligaments are rigid and provide some protection, the median nerve is not immune to potential damage in this area. 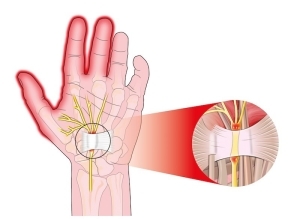 The passageway itself is narrow, leaving the nerve bundle inside at particular risk for compression and constriction, which is thought to be the source of the pain in cases of carpal tunnel syndrome. 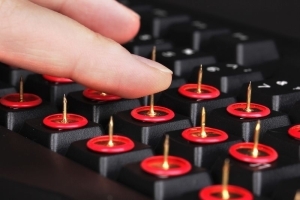 The exact cause of carpal tunnel pain is not fully understood. As noted above, it is believed that the source of the condition is associated with the compression and constriction of the median nerve within the carpal tunnel passageway. This nerve can be compressed in a number of ways. There has been some suggestion that a portion of individuals suffering from carpal tunnel pain were predisposed to developing the condition based on their genetic make-up. For example, individuals with genetically smaller passageways are believed to be at an increased risk for damage or irritation to the median nerve as the result of inflammation and compression. Other congenital risk factors believed to place individuals at greater risk for developing carpal tunnel pain include age and gender. Previous studies have indicated that body mass index and certain medical conditions may also increase the risk for developing carpal tunnel syndrome. For example dysregulated pituitary gland, rheumatoid arthritis, and hypothyroidism all increase the likelihood of developing symptoms of carpal tunnel. Women who are pregnant may experience symptoms of carpal tunnel pain. Though it is somewhat unclear, many researchers believe that this is due to an increase in fluid retention during pregnancy. Further, obese individuals are also more likely to develop symptoms of carpal tunnel. Previous studies have also revealed a number of environmental factors that are associated with carpal tunnel syndrome. For example, individuals who have sustained either acute or chronic trauma to the wrist or forearm are likely to exhibit increased swelling in the area near the carpal tunnel, which may result in compression of the median nerve or even injury to the nerve itself. Further, it is widely known that an individual’s environment at work may significantly contribute to their risk for developing carpal tunnel syndrome. It has been well documented that frequent forceful exertion at work or engaging in more hand-related activities can lead to carpal tunnel syndrome. Carpal tunnel syndrome is associated with pain and discomfort within the hand and wrist. The pain associated with this condition can be particularly detrimental, as it may prevent individuals from being able to perform necessary functions at work. Fortunately, there are a number of treatment options available. For individuals experiencing more mild to moderate symptoms of carpal tunnel syndrome, successful treatment of the pain and discomfort can be achieved using more conservative approaches. For instance, mild cases of carpal tunnel may be successfully treated with the use of a supportive brace or wrist splint. The brace or splint provides additional structural support and protection, giving the area time to heal and decrease inflammation. In conjunction with a supportive wrist brace, individuals may wish to take an over-the-counter oral analgesic, such as a non-steroidal anti-inflammatory drug (NSAIDs). This particular type of over-the-counter (OTC) pain reliever aids in reducing inflammation to the area that is likely contributing to the pain. Oral diuretics have also been recommended for individuals with symptoms of carpal tunnel syndrome, as they will decrease fluid retention. This will then reduce any swelling in the body and, ideally, release any pressure placed on the median nerve that may be causing irritation. There is growing support for the successful use of corticosteroid injections in the short-term treatment of acute carpal tunnel pain. Of note, results from a survivor analysis indicated that up to 33% of patients who were receiving corticosteroid injections to treat the pain and discomfort associated with carpal tunnel syndrome denied undergoing any further treatment for their symptoms at a two-year follow-up. While these treatments provide relief to the majority of individuals with carpal tunnel syndrome, there are a number of individuals whose symptoms are refractory and more severe. For these individuals, a more invasive procedure, such as surgery, may be warranted. Surgery for carpal tunnel syndrome is, indeed, regarded as a last resort. The goal of this surgery is to release pressure placed on the median nerve by cutting the transverse carpal ligament. 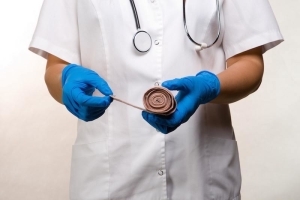 There are two types of surgery available: open release surgery and endoscopic surgery. The procedure for an open release surgery involves the making of a small incision (no more than two inches in length) on the wrist to access the carpal ligament. Open release is typically performed on an outpatient basis, under local anesthesia. In contrast to an open release, endoscopic surgery is associated with faster recovery and lower postoperative pain and discomfort. The procedure for endoscopic surgery is comprised of two very small incisions (no more than a half an inch each) made on the wrist and palm. A camera attached to the end of a small tube is then inserted and used to guide the operating physician in locating and lacerating the carpal ligament. This procedure can be done under local anesthetics and minimizes scarring. The exact cause of carpal tunnel syndrome is not well understood. It is believed that compression and injury to the median nerve accounts for the symptoms of pain, numbness, weakness, and tingling associated with this condition. Both genetic and environmental factors have been identified as contributing to the risk for developing carpal tunnel syndrome. There are many treatment options available, which range from conservative methods that can be done at home, to more invasive procedures, such as surgery. It is recommended that individuals speak with their physician or health care provider about the appropriate treatment option for managing the pain and discomfort associated with carpal tunnel syndrome. Fernandez-de-Las-Penas C, Cleland JA, Plaza-Manzano G, Ortega-Santiago R, De-la-Llave-Rincon AI, Martinez-Perez A, Arroyo-Morales M. Clinical, physical, and neurophysiological impairments associated with decreased function in women with carpal tunnel syndrome. J Orthop Sports Phys Ther. Jul 2013; [Epub ahead of print]. NIH. Carpal Tunnel Syndrome Fact Sheet. July 2012. NIH Publication # 12-4898. Retrieved from: http://www.ninds.nih.gov/disorders/carpal_tunnel/detail_carpal_tunnel.htm#236423049.